That was a great Cherry Festival week! Perfect weather, great events and really smooth coordination. But now I’m ready for some peaceful time alone with Mother Nature and away from other human beings. If you’re feeling the same way, here’s a tip: try the new Sleeping Bear Heritage Trail. It’s splendid! More than a million people visit the Sleeping Bear Dunes National Lakeshore each year – and that number has been rising since last year, when viewers of “Good Morning America” voted it the Most Beautiful Place in America. But almost all those visitors arrive by automobile and must do all their traveling within the park by car. 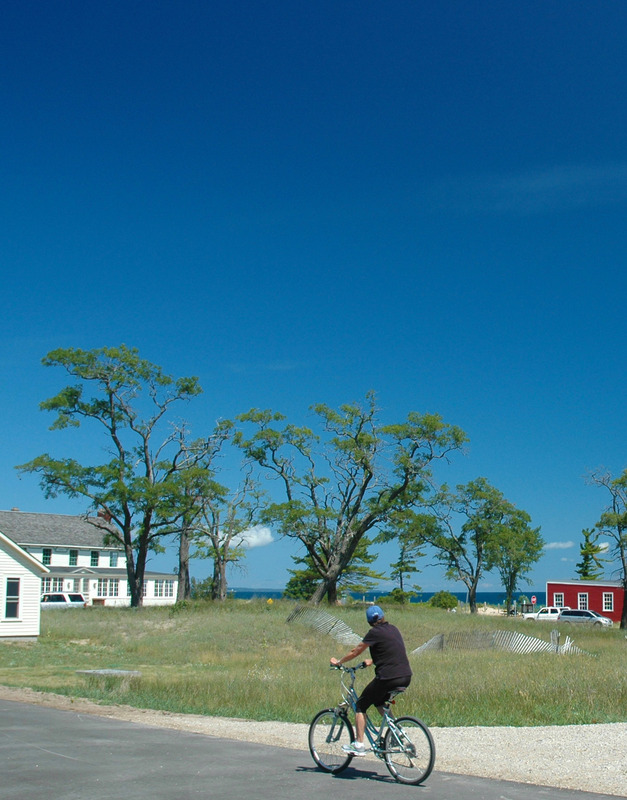 Even hikers and cyclists have to drive at times, because even though Sleeping Bear boasts over 100 miles of unpaved hiking trails, the trailheads are widely separated. The park’s main points of interest are linked by roads, but park planners created no alternatives for visitors who’d prefer to leave their cars behind. 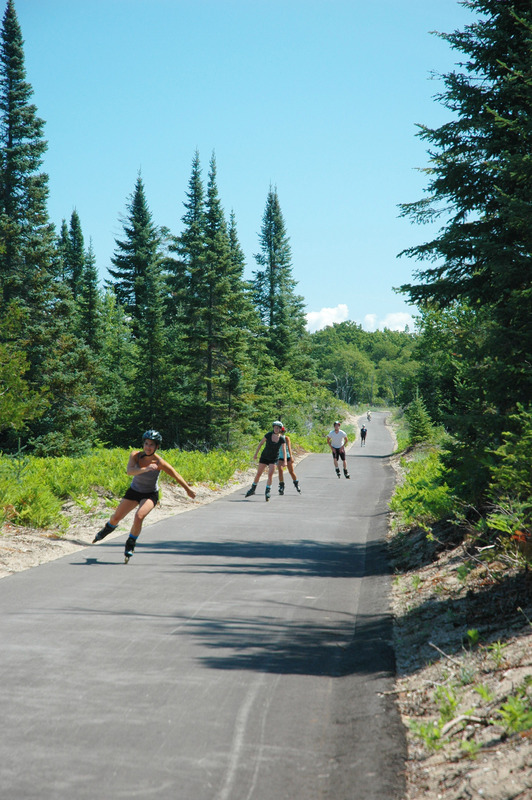 This summer, the National Park Service and a handful of local citizen groups unveiled the first four-mile stretch of the Sleeping Bear Heritage Trail, a 27-mile surfaced multi-use trail that will give walkers, runners, wheelchair users, cyclists, cross-country skiers, baby strollers, and rollerbladers a safe, enjoyable, and car-free way to explore the park. 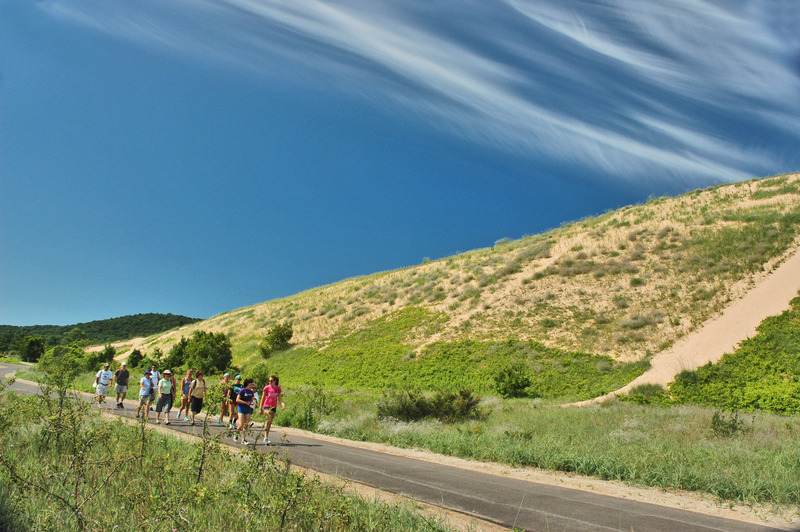 The inaugural link in the trail, which opened in June, runs from the much-photographed “dune climb” area through the ghost port of Glen Haven to the nearby village of Glen Arbor. Since its June 20 opening, the Heritage Trail has become a busy thoroughfare for cyclists, walkers and stroller-pushing families, he says. The new pathway has been several years in the making. It first surfaced as an idea in 2001-- ironically, as part of a plan to preserve the scenic and historic character of the park’s existing roads and highways. Rather than widen roads to make them safer for cyclists and pedestrians, park officials and local residents suggested building a 10-foot path for the exclusive use of non-motorized travel. Construction of the new trail will reduce potential conflicts between motorists and cyclists, who won’t have to ride on the shoulder of the highway -- and youngsters with bikes won’t be stuck “doing circles” in park campgrounds. And since it will be open to wheelchairs, it will provide a higher level of accessibility to visitors who haven’t been able to reach many areas of the park. For most of its length, the Heritage Trail will use old rail beds, roadways, trails and existing road rights-of-way as a way to minimize environmental damage. Interpretive exhibits are being planned along the route to help visitors understand and appreciate the park’s natural and historic resources. The trail will run from the park’s northern boundary to a point south of the village of Empire, and park officials say it will be similar to trails in other national parks. In some areas it will be completely paved, while other stretches will be surfaced with hard-packed gravel or raised boardwalk. Rollerblading the trail at its southern end. The next phase of construction will be a six-mile stretch that will link the newly-opened trail segment with the village of Empire to the south. If all goes well, says, Ulrich work could begin in the spring of 2013. Thanks to another volunteer group, the Friends of Sleeping Bear, yet another trail is in the works. The Bay to Bay Backpack and Kayak Trail will stretch from Platte Bay to Good Harbor Bay, linked by primitive campgrounds close to the water’s edge, paralleled by a “water trail” for paddlers. Work on it should begin in late 2012.